It’s no secret that SaaS companies like to beat their chest about their performance. Everything from growth rates to conversion tactics get touted across blog posts, press releases, and conference talks. Oh, and let’s not forget the explosion of LinkedIn selfie videos (have you checked out our Weekly Walks?). You know what doesn’t get bragged about? Pricing. Nobody is shouting from the rooftops about the recent pricing change they just made and the impact it had on their business. It’s easy to understand why. Pricing changes typically mean increases in price. SaaS companies want those to go under the radar. They don’t want to spook their existing customers or their prospects. Nobody wants to relive what Zendesk went through back in 2010 when a pricing announcement promptly led to a customer backlash (TechCrunch actually ran with the headline ‘Zendesk Raises Prices, Pisses Off Customers’). To Zendesk’s credit, they had tried to be “as thoughtful, transparent, and straightforward as possible” about the pricing change. Ultimately the company had to walk back the move, opting to grandfather pricing to all existing customers without a time limit. This secrecy about pricing does a disservice to the SaaS community as a whole. It gives emerging startups the impression that either (A) pricing is a dark art and should be kept secret or (B) there’s not much incremental revenue to be gained from spending time on pricing. If you’ve been following OpenView Labs, you know that it’s been our mission to shine a light on SaaS pricing. It should come as no surprise then that we put a special emphasis on pricing in this year’s Expansion SaaS Benchmarks study. 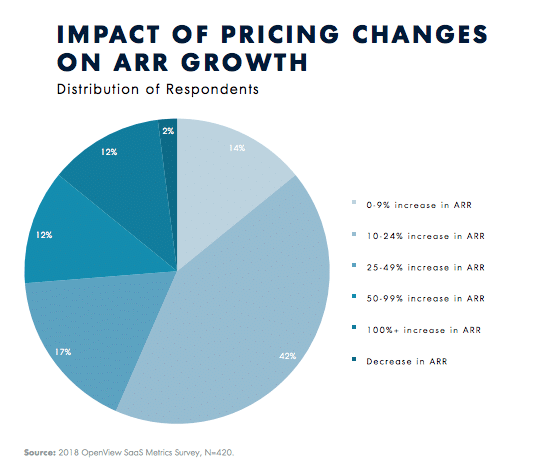 OpenView collected data from more than 400 SaaS companies about how they price, whether they changed pricing in 2017, and what impact those pricing changes had on their growth. The results were extremely powerful – even for someone who spends much of their time thinking about pricing. Of companies that changed their pricing in 2017, only 2% said that pricing changes led to a decrease in their growth rate. Framed differently, for 98% of companies pricing had either a positive or neutral impact on their growth. How many other tests could you run that have a 98% chance of working (or at least doing no lasting harm)? Frequently these pricing changes had a substantially positive impact on growth. 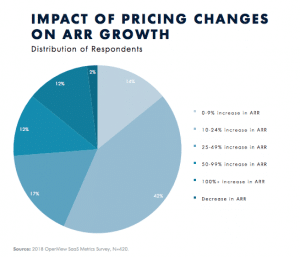 Two-in-five companies that altered pricing reported a 25% or higher increase in ARR as a result. This is staggering. Consider that the median company in our survey grew 80% year-on-year during the expansion stage ($2.5-10M ARR) and 46% during the growth stage ($10-20M ARR). Pricing changes account for a relatively large percentage of that growth. Growth from pricing is profitable, sustainable growth as well: it doesn’t require huge investments in new sales reps or larger marketing budgets. There are three main ways that pricing accelerates growth. First, and most common, is higher revenue per customer (price increases, premium packages). But that’s not all. Pricing can also drive better win rates (entry packages, segmented pricing, new pricing models) and net dollar retention (upsell paths, usage-based pricing). The foundation of any successful pricing initiative is executive alignment on which metric(s) you want to impact through pricing and how that translates to overall business growth. Let’s address another myth about SaaS pricing: that it’s only something to optimize when new customer acquisition starts to stall. This would imply that while pricing changes might accelerate growth in the short term, companies that change their pricing on the whole don’t grow as quickly as their peers. That turns out to be false. First off, more than 60% of the companies we surveyed changed their pricing in 2017. There was a high rate of pricing changes regardless of company size or funding round. Secondly, companies that changed pricing consistently grew faster than their peers who didn’t. The median growth rate of those who changed pricing was 65% versus 50% among those who kept pricing as-is. HubSpot: Introduction of contact-based pricing helped improve net dollar retention from 75% to almost 100% according to Chief Strategy Officer Brad Coffey. Logikcull: Launch of pay-as-you-go (PAYG) pricing model helped increase customer count by 500% in under a year according to CEO and Co-Founder Andy Wilson. 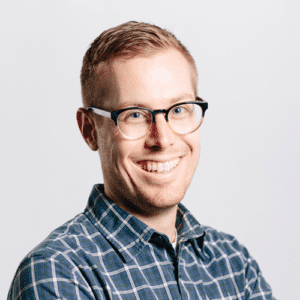 StatusPage: Charging for their free plan and raising prices allowed them to increase ARPU by 2.4x without hurting conversion according to Co-Founder Steve Klein. Netflix: 2017 pricing changes increased growth by 10%, corresponded with higher than expected subscriber growth, and caused Netflix’s stock price to soar. If companies won’t brag about their pricing changes, I’ll do it for them. Pricing is an extremely powerful, overlooked growth lever. It’s high time we build knowledge, experience, and confidence about the art and science of pricing. (PS, this book is a good starting point! ).